Welcome to the second part of the Forest House tutorial. You can access the first part here, in case you missed it. In this second part of the Forest house tutorial, we will focus on setting up materials for our render. We prepared basically only 5 materials breakdowns, as the other materials are very simple (only diffuse textures). We will get through Metal, Pavers, Stone wall, Wood Fir and most important - wooden shigles. 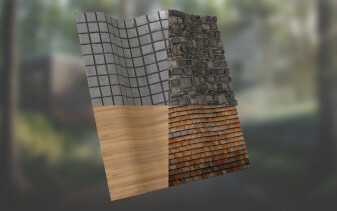 Besides using textures by Arroway for most of these materials, we will create shingles by ourselves in Photoshop. All inluded in the tutorial! Let's start. Part 1 was a wonderful detailed tutorial. I have done it all and have a nice model ready for part 2. Unfortunately part 2 and 3 are minimal , and it is not possible to go on based on these tutorial.